Rice chemist James Tour and his colleagues have developed a flexible material with nanoporous nickel-fluoride electrodes layered around a solid electrolyte to deliver battery-like supercapacitor performance that combines the best qualities of a high-energy battery and a high-powered supercapacitor without the lithium found in commercial batteries today. The new work by the Rice lab of chemist James Tour is detailed in the Journal of the American Chemical Society. 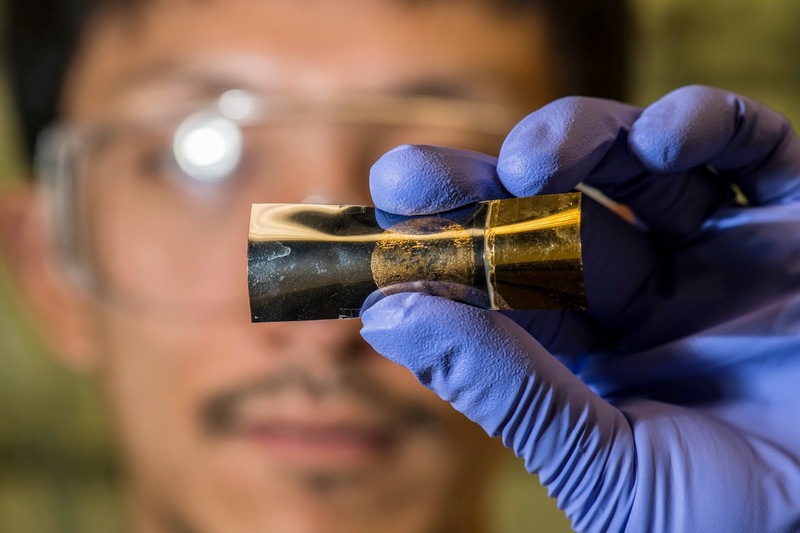 In tests, the students found their square-inch device held 76 percent of its capacity over 10,000 charge-discharge cycles and 1,000 bending cycles. Tour said the team set out to find a material that has the flexible qualities of graphene, carbon nanotubes and conducting polymers while possessing much higher electrical storage capacity typically found in inorganic metal compounds. Inorganic compounds have, until recently, lacked flexibility, he said. Rice graduate student Changsheng Xiang and postdoctoral researcher Gunuk Wang are co-authors of the paper. The Peter M. and Ruth L. Nicholas Postdoctoral Fellowship of the Smalley Institute for Nanoscale Science and Technology and the Air Force Office of Scientific Research’s Multidisciplinary University Research Initiative supported the research.